Both courses are offered free to people unemployed or in receipt of benefits. A £20 refundable deposit will be required to secure your place. We will require evidence of your benefits or income to confirm your eligibility for a free place. The subsidised places are funded by Bristol City Council. 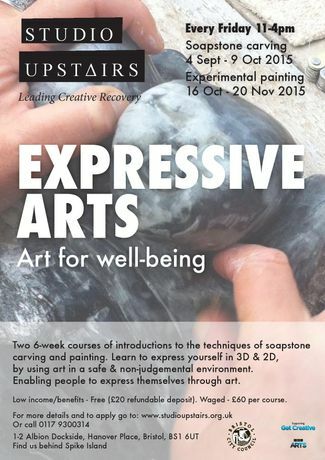 Studio Upstairs Bristol is pleased to offer its Expressive Arts courses; two terms of 6 week introductions to the techniques of soapstone carving or painting. Studio Upstairs believes in artistic practice as a valuable way to create meaning and purpose in life, leading from isolation to community. The courses for adults, aged 18 and above provides an opportunity for people struggling with life’s difficulties to gain a new skill in a safe, open minded and creative environment. No previous experience in art making is needed and a experienced artist tutor will lead you though the techniques and processes. All materials are provided. The course will run weekly on a Friday and will begin with a taught session that will include a introduction to tools, art mediums and techniques. The day will continue with your tutor available to offer suggestions and help. Our tutors are qualified art therapists and physiotherapists. The course teaches people the basics of painting and soapstone carving, prepares participants for continuing with pieces when they move on from the studio and is a positive step towards using art as an expression. At the end of each course, a celebration evening will be held to invite friends and family to enjoy and share in the work created at the studio during the 6 weeks. These courses are supported by Bristol City Council.